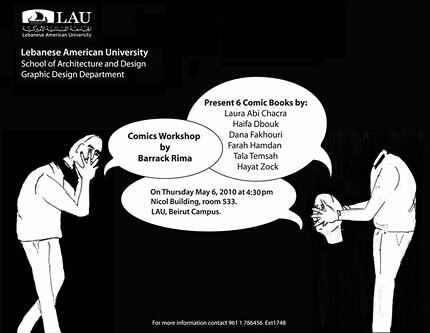 A comics workshop will be given by Barrack Rima. You will be able to view six comic books by Laura Abi Chacra, Haifa Dbouk, Dana Fakhouri, Farah Hamdan, Tala Temsah, and Hayat Zock. For more information, contact: +961-1-786456, Ext. 1748.